The dicotyledons, also known as dicots (or more rarely dicotyls), are one of the two groups into which all the flowering plants or angiosperms were formerly divided. 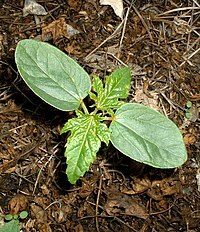 The name refers to one of the typical characteristics of the group, namely that the seed has two embryonic leaves or cotyledons. There are around 200,000 species within this group. The other group of flowering plants were called monocotyledons or monocots, typically having one cotyledon. Historically, these two groups formed the two divisions of the flowering plants. The following lists show the orders in the Angiosperm Phylogeny Group APG IV system traditionally called dicots, together with the older Cronquist system. 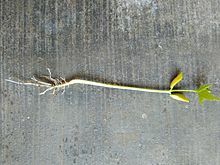 In the Dahlgren and the Thorne systems, the subclass name Magnoliidae was used for the dicotyledons. This is also the case in some of the systems derived from the Cronquist system. For each system, only the superorders are listed. The sequence of each system has been altered to pair corresponding taxa, although circumscription of superorders with the same name is not always the same. ^ "Dicotyl". The Free Dictionary. Retrieved 2 January 2016. ^ a b "Monocots versus Dicots". University of California Museum of Paleontology. Retrieved 25 January 2012. ^ Stuessy, Tod F. (2010). "Paraphyly and the origin and classification of angiosperms" (PDF). Taxon. 59: 689–693. This page was last edited on 27 March 2019, at 07:23 (UTC).